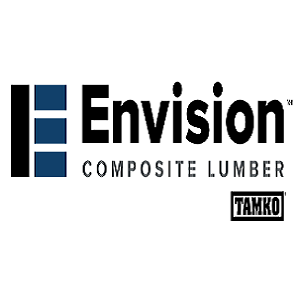 In a relatively young industry, EverGrain and Envision decking has quickly become a leader. We believe this is due to our commitment to quality and our history with composite products. Our parent company, TAMKO®, is a leader in the building products industry and has been a pioneer in composite roofing . We’ve adopted their simple philosophy; do your best, be fair and honest, and believe in those around you. Our products feature specially blended color for the unique look of exotic hardwood. Our woodgrain is unique with a deep wood like appearance. Our products are also manufactured right in the heartland of the USA. The EverGrain® line sets the standard in composite decking with its deep-grain and solid coloring. Featuring timeless textures and pronounced pattern capturing the essence of a natural wood board. Your deck is an extension of your home and should capture your personality as you look to entertain and bring your family outdoors. Pick from four striking colors – Cape Cod Grey, Cedar, Redwood or Weathered Wood – to create the go-to picturesque retreat. Traditional in nature, the Envision Inspiration® line subtly blends colors to evoke the character of real wood planks and boards. The Inspiration® line enhances the ambiance of your home with unparalleled beauty. Our boards are created to reveal a deep-grained, textured board that mimics the variety of random patterns found in natural milled boards. These boards inspire you to expand your living space outside your four walls, and encourage you to enjoy the outdoors once more. For the homeowner and family who want the luxury of composite decking and aren’t ready to push the envelope like the coloring found in the Distinction® and Inspiration® lines then the definite, rich colors from Expression® are what your home needs to make it your personal (and family) escape. Featuring solid colors that provide a composite board to mimic a natural wooden board. The Expression® line features a deep grain, high-quality plank without the hassle of the upkeep found in real wooden boards.